The majority of India's 560m mobile subscribers consume two kinds of content, one which is served via their telecom service provider and the second which is served via their friendly neighborhood retail outlet. The former gives them ring tones and content via SMS, whereas the latter gives a richer experience of movie clips, funny videos, music and games for a small "fee". To add, there is an emerging third kind, where the Telco provides a data pipe which brings the Internet experience to the mobile. Unlike the rest of the developed world, desktop Internet still has a long way to go in India. The impediment is low literacy coupled with low per-capita income. Apart from a personal cellular phone, the number one household electronic gadget of choice is Television, which still enjoys a healthy demand. 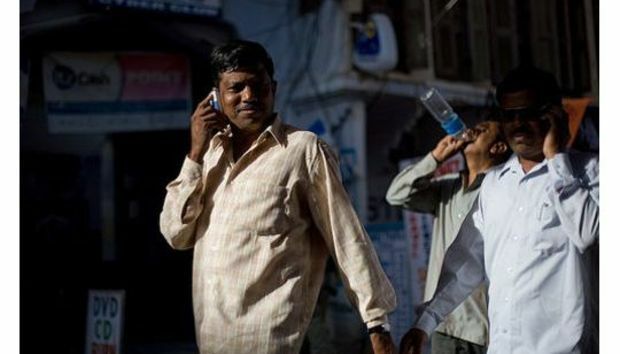 Compared to the number of phones, India has 12 million broadband connections with 100 million users on the Internet. Most of the Internet users are in urban areas where they access Internet from work, home and cybercafés; delivering technologies like DSL, Wi-Max, CDMA/3G. In smaller towns, access to high-speed Internet is primarily via a wire-line connection serving DSL speeds. BSNL, a government owned public sector unit - which is much chided for being a large bureaucratic organization has brought connectivity to the majority of towns and villages. Today in India, an always-on, upper-tier, unlimited high-speed DSL connection with a 1Mbps monthly plan, can be subscribed for as low as Rs. 850 (USD 20). Compare this with an entry level AT&T Express plan of USD 14.95/month giving 1.5 Mbps serving the city of Cupertino in California. Indians like Cricket, Bollywood and political gossip. Most of the Internet content still moves within the walls of the Silicon Valley, bellwethers like Facebook, Google and Yahoo, who now run large operations targeted at Indian consumers. If YouTube was a TV channel in India, it would be the 11th largest with 20 million unique users per month. 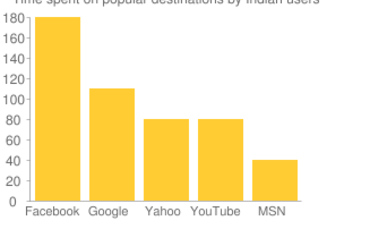 The chart below shows the popular sites where Indian users are spending time every month. However, things are heating up locally and traditional media houses are paying attention. There are destination websites serving music-on-demand, downloadable apps for smartphones, frequently bundled online games package and TV on demand. Most importantly, VAS providers who were primarily serving ring-tones and wallpapers, are now creating appstores, payment infrastructure to facilitate commerce, content serving platforms and initiatives to support the surge of 3G. It is often joked that India has more mobile phones than toilets, but a large geography and 20-odd languages does not make things any easier. The killer app for running the country is mobile connectivity, which increases access to information. While the rest of the world were educated first and exposed to the Internet later; India is getting Internet first and content delivered via this connected medium will educate the country. By Indus Khaitan, a General Partner at The Morpheus. Amongst other things, he is an entrepreneur, web data miner and presentation delivery coach.